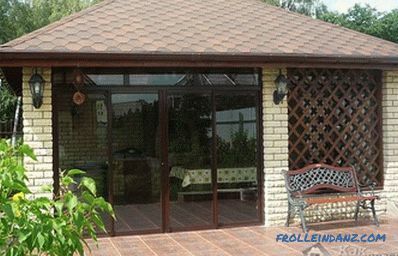 Nowadays, people often buy country houses, not only to grow vegetables and fruits there, but to relax in the lap of nature, sit with best friends or family. Such places, as well as homes in the private sector within the city, help to escape from the hustle and bustle of city life, admire the fresh greenery. However, bad weather or scorching sun may somewhat impair rest. 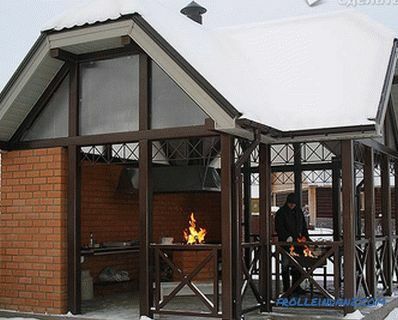 If you make a gazebo in the backyard, then it will be possible to have a comfortable time in it, not only in summer, but also in winter. While thinking about the construction, each one makes his own plan of how this building will look like. It is easier for someone to build something inexpensive and simple, as a rule, these are lightweight structures, while others prefer structures made from more durable material. 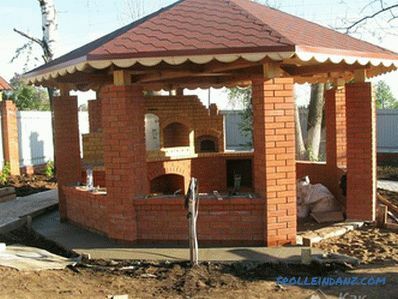 After reading this article, you will learn how to build a brick arbor on your own. 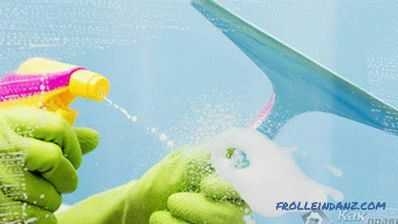 First you need to complete a number of preparatory work . After creating a project on which it will be possible to realize all your desires regarding the arbor and decide on its location, you can proceed to the construction process itself. Before the foundation is constructed, it is necessary to clear a place under the perimeter and outline the corners. 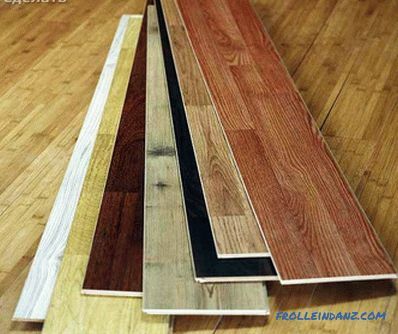 It is necessary to remove about 200 mm of fertile soil, which can then be used for other purposes. 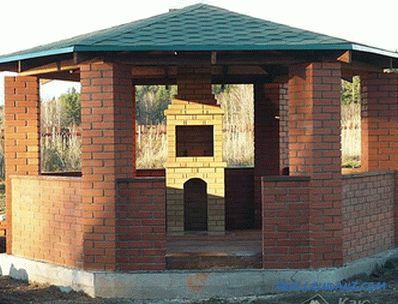 It is important to determine the place of construction on the basis of operational functionality - if there is a brazier, where the smoke will go, whether the gazebo will be in harmony with the environment and nearby buildings, and so on. Then you can start building the foundation. Given that our building will have considerable weight, the creation of this part of the building must be taken seriously. The foundation must be strong enough to withstand the weight of the walls and roof, but at the same time it should not be done such as if a one-story house will stand in the place of an arbor. Requires accurate and correct calculation. 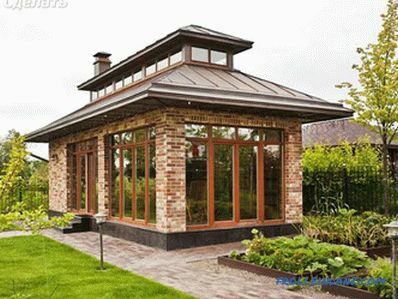 One of the requirements for a foundation is its resistance to precipitation. For the foundation, you can apply building materials that are not afraid of moisture, corrosion, as well as various insects - stones, bricks or concrete poured into the formwork are best suited. 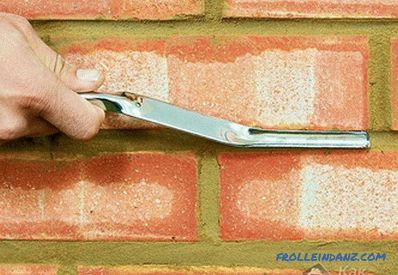 With a wall thickness of 140 mm (the thickness of the brick laid flat and plaster on both sides), the width of the foundation can be taken to be similar. The foundation should not be too deep, but this criterion depends on the soil on which it is built. 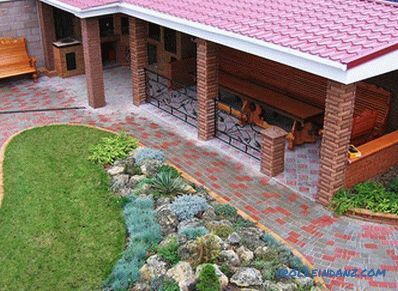 In clayey soil, it is enough to go 20-30 cm deep, and for sand or base, where the occurrence of clay or another solid layer is lower, it is necessary to make a deeper foundation, sometimes up to half a meter. 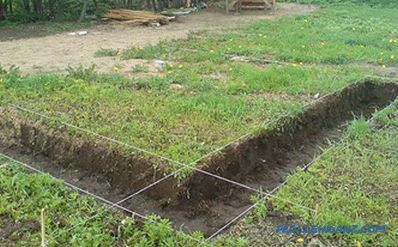 Considering the type of soil, it is necessary to consider whether there is ground water on the site where the arbor will be built and whether they do not flow too high to ground level. One person can handle the foundation work, and he doesn’t have to be an expert in building such structures. The correct proportions in the construction of the mortar for laying brick foundations or the ratio of substances in concrete will help to make this work front correctly, easily and quickly. The type of arbor and its shape will affect how to make a foundation. 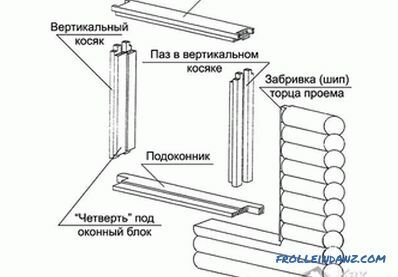 So, if the walls are not solid, for example, there will be fences only behind and a little on each side, and columns are installed in the front, then there is no need to build a solid closed foundation - it is needed only under the columns and where it is planned to build walls. 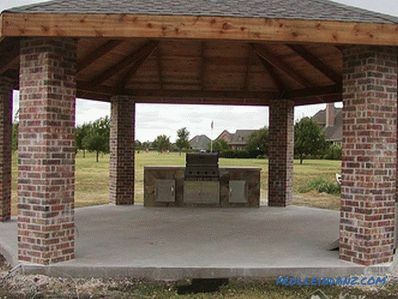 If you plan to place a fireplace or a barbecue, it will be useful to build a simple foundation for these structures. If the walls are from all sides, then the foundation will repeat the shape of the walls. 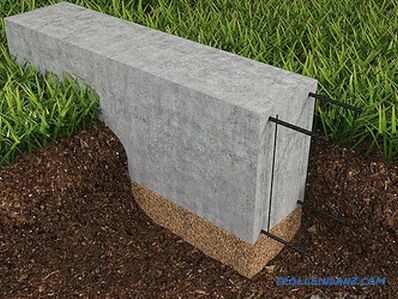 Properly constructed foundation - a pledge of smooth walls. 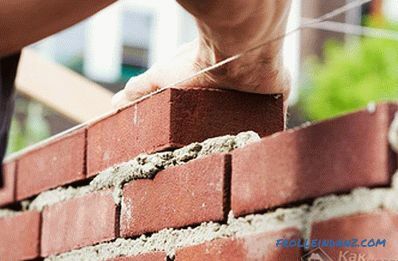 The disadvantage of brickwork in addition to the high consumption of cement and sand is the long duration of work, as well as the presence of a bricklayer.Of course, crooked brickwork can be leveled with plaster or various finishing materials, but this is not an option. 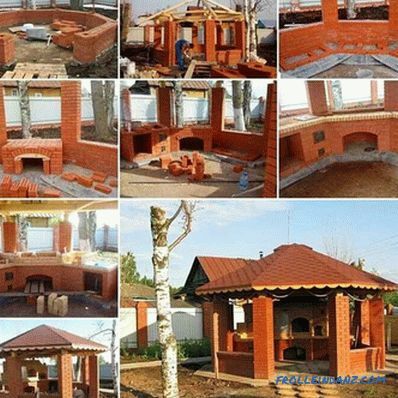 If you use a few useful tips, the laying of bricks can be made more or less even, even without experience and skills. It is necessary to place the entire height of the edges of one wall along the beacon of square section. Small bars or metal CD profiles will do. By placing them on a level so that their horizontals are even from all sides, you can fix the beacons. A line is drawn between them, which is strongly stretched by the level of the first row of bricks. The evenness of the fishing line is checked using the construction level. Before you use a level, you need to check it to see if the tool is not shot down. For this, a horizontal surface is selected and a level is attached to it. We remember where the bubble is located, which determines the level, after which the instrument is turned over by the other side. If the bubble in the second case is in the same place where it was first, then the tool is working, if not - it is better to replace the construction level with a new one, which also doesn’t hurt to check before buying. 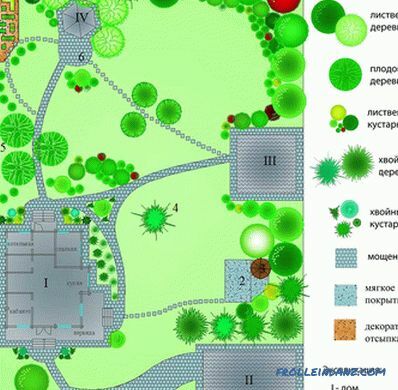 Before the beginning of the laying of the walls, it is necessary to determine which engineering communications will be connected to the gazebo and laid in it. For example, laying sewage and water supply, if they are, it is better to engage in building the foundation; . To make it easier to make the above hole, you can lay a 110 mm sewer pipe in the wall, lay it over with a brickwork, and when the cement hardens, hold a 100 mm corrugated metal inside the pipe and fix it with cement sand. solution. 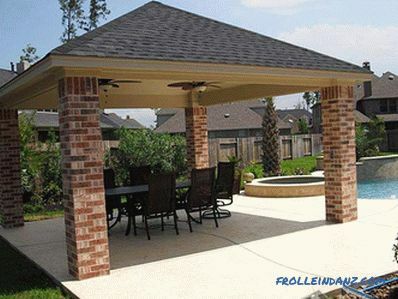 Now let's talk in more detail about the roof structure of the gazebo. In order to fasten the truss structure to the walls, it is most convenient to lay metal rods in the places where it is planned to fix the rafters during laying. These brackets can be welded brackets, which will later be fixed rafters. 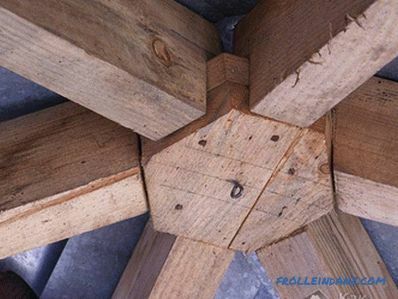 If metal pillars are inserted into the wall in advance before the laying, then the rafters can also be attached to them. A crate is made on top of the rafters - often for this they use wooden slats 40 mm thick, which are nailed to the rafters. On the crate, you can mount any roofing - asbestos cement sheets, decking, metal roofing and more. The main thing is to remember that each sheet goes to the next one with an overlap of at least one wavelength - so that water does not flow through the roof after rain or from melting snow. 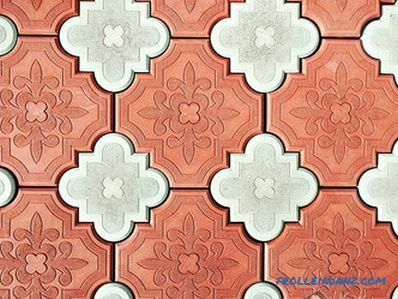 Main interior work front is to perform interior and exterior finishing work. 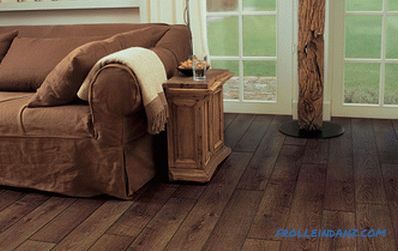 The interior work can be attributed floor screed, plaster walls, ceiling device, in some cases - installation of a fireplace or barbecue (it all depends on the choice of the owner and the type of gazebo - it is closed or open type). Some exterior works are also needed - exterior finish, blind area device and weir fixing. 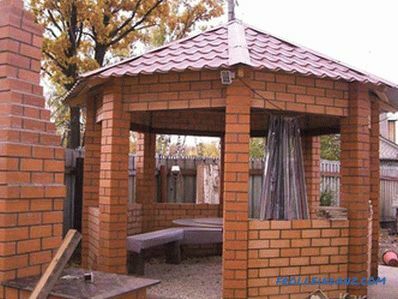 For flooring in the gazebo, which will last a long time and will be beautiful, you can use ordinary paving slabs. How to make a blind area? For this, a 50 cm wide construction will be suitable. Its level must be below the floor covering, and the blind area itself must have a slope to the side of the street, so that water from precipitation can flow along it. To construct a blind area, you will need to make a formwork of boards or a metal square profile. 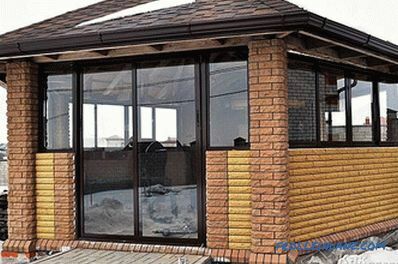 The thickness of the blind area should be at least 10 cm, it is desirable to make a sand pillow under it, with a similar thickness - the clay will not allow moisture to penetrate under the arbor basement, and will not allow walls to be damp. If the walls were perfectly aligned, then the optimum thickness of the plaster inside and outside the walls will be 10 mm. Inside the walls can be glued tiles. 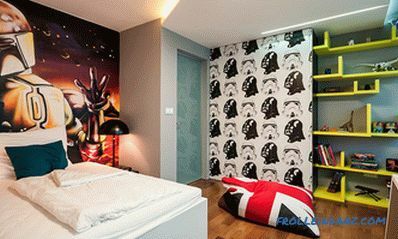 You can also revet the walls with plastic panels or wooden clapboard. Outside, the walls are putty and painted with water-based paint. If you plan to operate in the winter, then the walls should be insulated with sheets of polystyrene foam 100 mm thick, then apply a reinforcing mesh and level the surface with glue-cement, then apply putty and cover with a water emulsion. In general, it is not so difficult to build such a structure if you follow all the above tips. 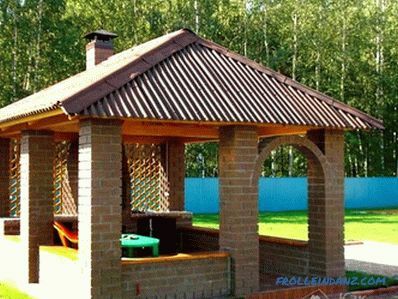 If some work fails to do it yourself or there is no certainty that they will be executed correctly, it is better to contact the specialists.In this case, the cost of the work will be higher, but the gazebo will be more durable, even and beautiful. How to build a gazebo on your own. Construction of a wooden arbor. Production of a six-sided arbor. We make a polycarbonate gazebo. How to make an arbor out of a shaped tube. Device and construction of an arbor with a brazier.